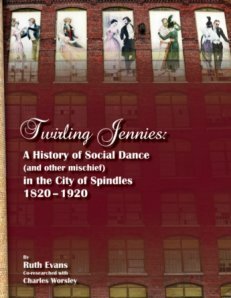 This lavishly-illustrated large-format trade paperback describes the history of social dance in the old mill town of Lowell, Massachusetts -- America's first real industrial city. The author was born and lives in Lowell, and is a longtime ballroom dancer specializing in historical dance. In this deeply researched volume she explains how dance has been a central part of the city's social life since its founding, and describes the gradual evolution from quadrilles and contras to the tango and the Charleston, with over 300 illustrations -- postcards, dance cards, photos, maps, and more. Along the way you'll find a few personal anecdotes, along with such historical curiosities as how polka dots got their name, why two policemen were required to dance a tango in open court, and much more. 228 pages; approx. 350 illustrations. Cover price is $28.95. The trade paperback is available from Amazon or Barnes & Noble. Because of the elaborate graphics, no ebook edition is planned. The author has a website devoted to the project.